What is an activist? What qualities do all activists have in common? How can art inspire activism? These are all questions the second graders pondered in the spring of 2016 as they researched and learned about global water collection practices. Their final art was displayed at our all-school art show, Water Works. The initial step in this collaborative art project was the discussion of water walks. Students traced their footprints and began to imagine what terrain people all over the world walk through to get water. Mud, puddles, concrete? Do they see flowers? Bugs? Students filled their paper footprint with these images. Later, the second graders applied their new understanding and appreciation of water access to a creative project using a 5-gallon jug as their “canvas.” Their goal was to deliver a powerful visual message to our school about this precious resource we often take for granted, and inspire a more thoughtful and gracious mindset around water at Presidio Hill School. This project was conceived during a conversation about symbols and simplicity in artwork. Each artist came up with a focus for their piece and designed symbols to represent their message. Students also wrote text to accompany their paintings, and integrated facts they had learned during their class research project. After the art show, the jugs were displayed around the school’s water sources to help remind our community to be mindful of excess water usage and appreciate the privilege of our easy access to this precious resource. We read and learned about many different women environmental activists and we researched how children live in different places around the world. Through this work, the second graders discovered that poor countries often do not have access to clean water and many problems can arise when a child doesn’t have clean water to drink. Kids often spend many hours walking to get water, which means they can’t do other activities like go to school or play sports. We also engineered water filters to clean contaminated water using materials like gravel, sand, coffee filters and cotton. 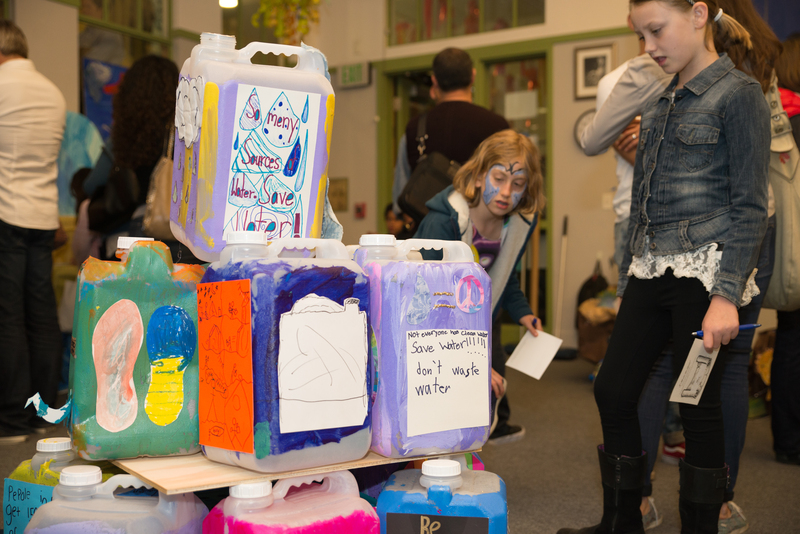 The 5-gallon jugs used in this project were gathered by the second graders from local San Francisco restaurants. These same jugs are often used in third-world countries to gather water for daily use. Children and women often carry these jugs miles and miles each day to find water, and this water is often dirty and unhealthy.